I can still remember my parents taking me to the art gallery growing up. We would go at least once a month on a Sunday because it was free that day. They would drag me there and I while I did admire the classic works from various periods in history it was not until I discovered the modern art section that my mind was engaged! I was in my teens when my appreciation of modern art changed. I guess it was time (I was a teenager in the 70’s and Andy Warhol was alive breaking rules and making money doing it) I was impressed by Warhol and his ability to manipulate the media which he was brilliant at doing but artists like Pollock really blew me away! I remember being mesmerized the first time I saw Jackson Pollock. 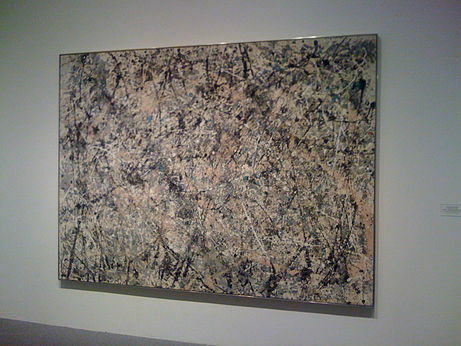 Pollock really got me interested in abstract art. Pollock’s work was visceral and cerebral at the same time for me. It seemed to capture infinity within the finite space of the canvas. The complexity of the organic patterns that while seemingly random could be perceived as having order…the paradox of it played not only with your eyes but your mind! This gallery is dedicated to that feeling excitement and bringing you new abstract artists that you can collect right now! These are emerging artists who stand out of the vast sea of hopefuls. These are artists who have an innate gift and are true artists. Self-taught and with skills that you simply can not learn but simply have! You know what is good, what is outstanding, you don’t need a degree in art…you need talent. Our first featured abstract artist is from Los Angeles and is quickly becoming recognized as an emerging abstract artist that you need to know about – Nestor Toro – Visit his website to find out more about this outstanding emerging abstract artist at his official website – NestorToro.com and discover just why his genuine voice is being heard in the highly competitive art world.